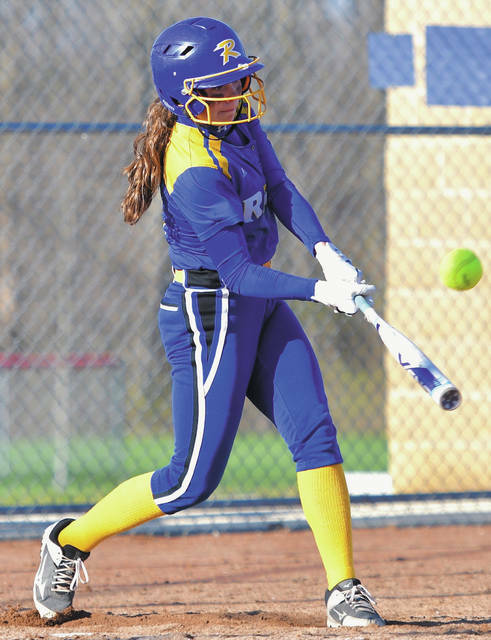 Russia’s Kennedie Goubeaux swings a pitch during a Shelby County Athletic League game on Monday in Houston. Goubeaux was 3 for 5 with 3 RBIs for the Raiders. 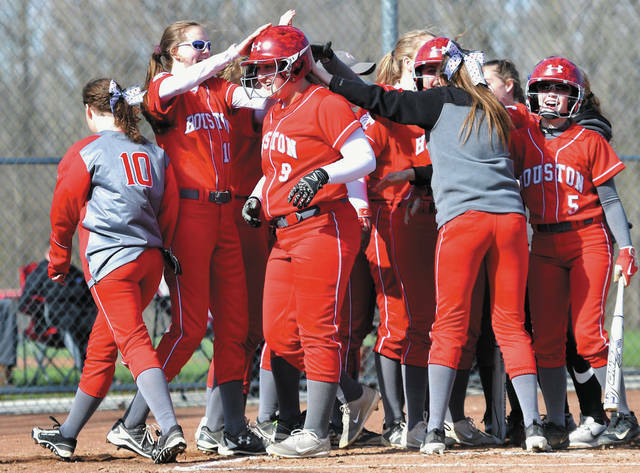 Houston’s players congratulate leadoff hitter Allisen Foster after she hit a home run on the first inning of a Shelby County Athletic League game on Monday in Houston. Foster, who was 4 for 5, hit a home run to center field on the first pitch of her at-bat. Houston pitcher Emilee Foster throws to first base during a Shelby County Athletic League game on Monday in Houston. Foster was 2 for at the plate. Houston's Addie White watches a pitch during a Shelby County Athletic League game on Monday in Houston. White was 3 for 4 and scored two runs. Houston's Allisen Foster hits a fly ball during a Shelby County Athletic League game on Monday in Houston. Foster was 4 for 5 with 3 RBIs. 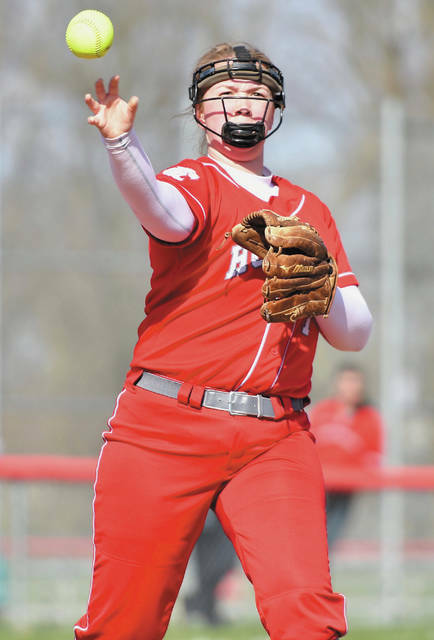 Russia Jenna Cordonnier throws to first base during a Shelby County Athletic League game on Monday in Houston. Cordonnier was 3 for 6 at the plate with 3 RBIs. Houston's Marah Sanders fouls off a pitch during a Shelby County Athletic League game on Monday in Houston. Sanders was 1 for 4. Russia's Kendall Monnin watches a pitch during a Shelby County Athletic League game on Monday in Houston. Monnin was 2 for 5. 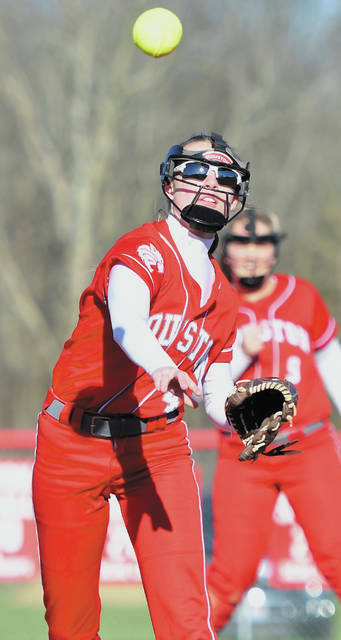 Houston's Rylie Voisard throws to first base during a Shelby County Athletic League game on Monday in Houston. Voisard was 2 for 3 at the plate. Russia’s Kendall Monnin hits a fly ball during a Shelby County Athletic League game on Monday in Houston. Monnin was 2 for 5. Russia’s Kendall Monnin throws to first base during a Shelby County Athletic League game on Monday in Houston. Monnin was 2 for 5. View more photos of Russia at Houston softball here. 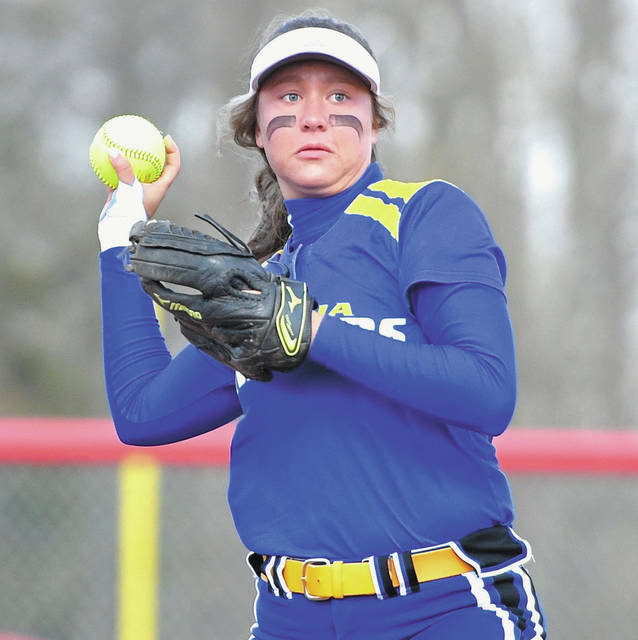 HOUSTON — The first half of Shelby County Athletic League softball play has made one thing clear: if you want to win the title, you better be ready to win a slugfest. Not just a slugfest of a tight back-and-forth game — but a ‘slug-fest’ that has more hits than can be easily counted in without the aid of a tally sheet. The season has been full of high-scoring games, and a battle for first place in the league on Monday was one of the highest-scoring yet. Russia overcame an early four-run deficit by scoring 10 runs in the fourth inning to jumpstart a 17-10 victory over Houston. The win ties the Raiders with the Wildcats for place in the SCAL. Both squads have 5-1 league records. Anna and Fort Loramie are tied for second with 4-2 records. “It’s going to be the bats this year for sure,” Russia coach Michelle Muhlenkamp said. 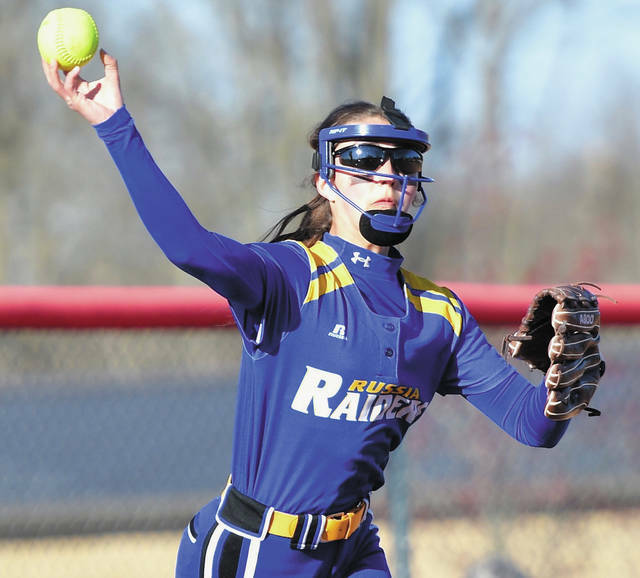 “Our freshman pitcher Sophie (Francis) did an awesome job tonight. She kept the ball low, and that’s all we ask for. We know they’ll put it in play, but we told her our defense would make plays behind her. Russia had 21 hits and five errors while Houston had 13 hits and six errors. The Wildcats (6-7) had the upper hand early. After Russia scored a run with two outs in the bottom half of the first inning, Houston leadoff hitter Allisen Foster hit the first pitch of her at bat over the 200-feet sign in center field to tie it 1-1. Russia (7-4) scored three runs on four hits in the third, but Houston scored seven runs thanks to five hits and a pair of fielding errors by the Raiders in the bottom half to take an 8-4 lead. Russia immediately responded by scoring 10 runs on nine hits in the top of the fourth to take a 14-8 advantage. Jenna Cordonnier and Ashley Scott hit 2 RBI doubles, Kennedi Goubeaux hit a 2-RBI single and Shea Borchers hit an RBI single before Houston swapped starting pitcher Emilee Foster for Peyton New in the inning. 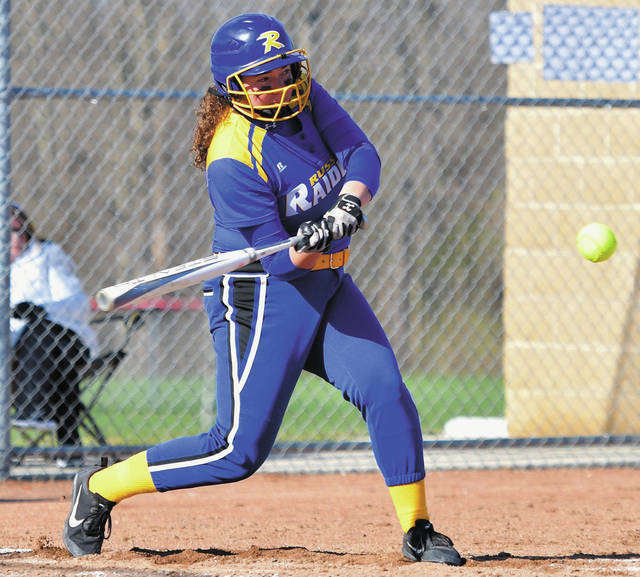 Cordonnier hit an RBI single of New before the end of the fourth, and the Raiders added three more runs before the end of the game to wrap it up. “We’ve been talking about mental toughness all year round,” Muhlenkamp said. “All year, we’ve said, ‘You’ve got to be tough mentally.’ This game will beat you down, but you’ve got to turn right back around and get the job done in the next inning, next at-bat or whatever. Houston coach Brent New said a pair of early fielding errors in the fourth inning helped cause a snowball effect. 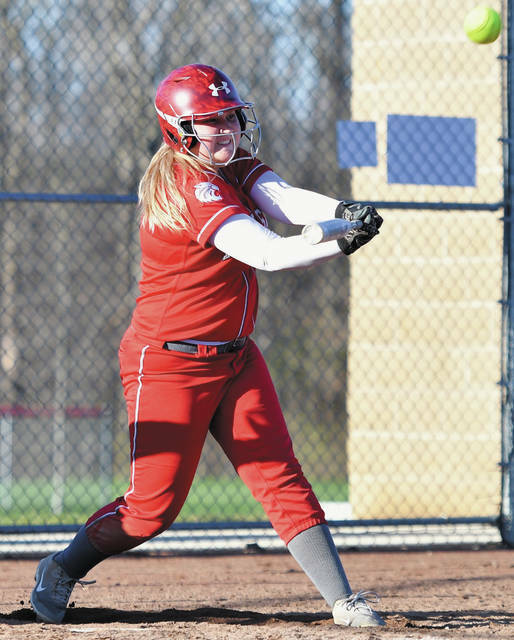 Borchers, Cordonnier and Scott each had three hits for Russia while Ava Daniel, Riley Hammonds and Olivia Moorman each had two. Scott, Goubeaux and Cordonnier each had 3 RBIs. Scott, who led the team with three runs, hit a pair of doubles. 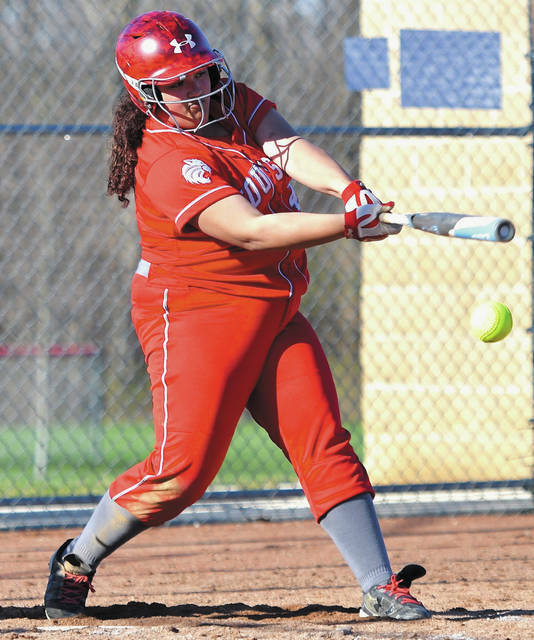 She’s a sophomore first baseman and is in her first year playing for the program. Muhlenkamp said her production in the No. 8 spot in the batting lineup has been a welcome addition. 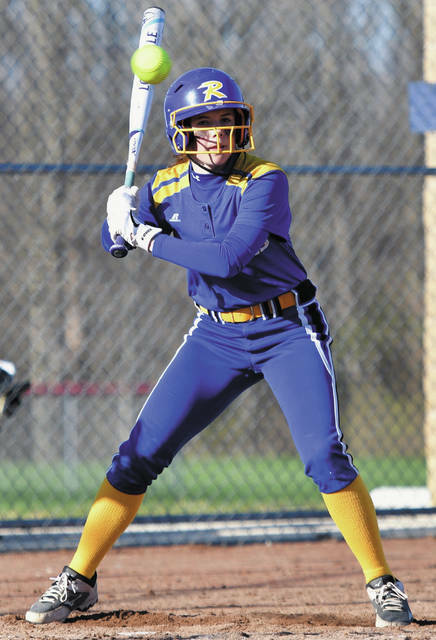 Allisen Foster had four hits, Olivia Bowser and Addie White each had three and Emilee Foster and Rylie Voisard each had two. The two squads will meet again in SCAL play on May 9. Entering Monday’s action, SCAL teams have combined for 15 or more runs in six of the 18 league matchups and have combined for 10 or more runs in nearly every game. That’s not including a boatload of high scoring nonconference games SCAL teams have been involved in. Of the 10 nonconference games SCAL teams played in last Saturday, all but one had at least 12 combined runs and six had at least 20 combined runs. Houston’s Addie White watches a pitch during a Shelby County Athletic League game on Monday in Houston. White was 3 for 4 and scored two runs. 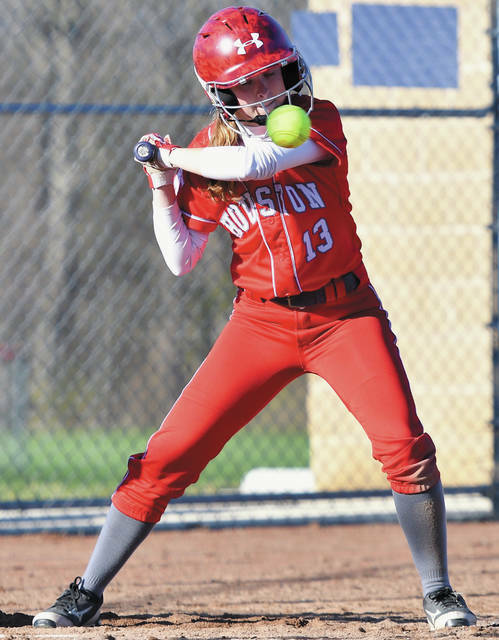 Houston’s Allisen Foster hits a fly ball during a Shelby County Athletic League game on Monday in Houston. Foster was 4 for 5 with 3 RBIs. Houston’s Marah Sanders fouls off a pitch during a Shelby County Athletic League game on Monday in Houston. Sanders was 1 for 4. Russia’s Kendall Monnin watches a pitch during a Shelby County Athletic League game on Monday in Houston. Monnin was 2 for 5. Houston’s Rylie Voisard throws to first base during a Shelby County Athletic League game on Monday in Houston. Voisard was 2 for 3 at the plate. This entry was tagged Allisen Foster, Brent New, Emilee Foster, high school, image, images, Jenna Cordonnier, Michelle Muhlenkamp, Morgan Wenrick, Peyton New, photographs, photos, pics, picture, Riley Hammonds, SCAL, Shelby County Athletic League, Softball. Bookmark the permalink.